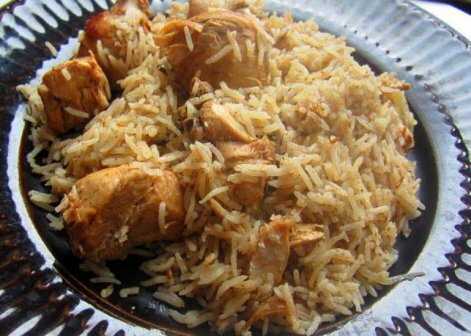 In a cooking pot, fry onions until brown (almost burnt but not – this give the brown color to the end product), add garlic, salt, pilau masala, allow to cook for 2 to3 minutes, add chicken and potatoes, let cook until cooked and potatoes half cooked. Pour in the rice, stir to combine all ingredients, then add the 1¾ cups water and bring to a boil over high heat with the cooking pot uncovered. Once the water level has gone down, lower the heat, cover with foil paper or brown kitchen paper and cook for a further 2 to 3 minutes or until water has dried up. Turn off your heat, fluff the rice and set aside for about 5 minutes. Serve with kachumbari and hot home-made chili.